Every night, before retiring for the day, we all sit together and say our prayers, one of which is the Devi Aparadhakshamapan Stotra. Yesterday night, after we had finished saying our prayers, Bapu (Aniruddhasinh), all of a sudden asked Suchit Dada to chant aartis of Sainath. 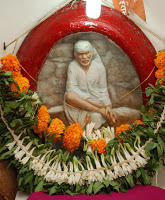 Dada then sang the Kaakad Aarti, and also Adkar’s aarti on Sainath which is part of Madhyaan aarti, and already available in Dada’s voice in the CD on the 33rd Chapter of Shri Sai Satcharita. Dada then sang the Namaskaaraashtak– “Anantaa Tulaa Ray Kasay re Stavaavay, Anantaa Tulaa Ray Kasay re Namaavay…” (अनंता तुला रे कसे रे स्तवावे, अनंता तुला रे कसे रे नमावे…). As Dada was singing these aartis we were all sitting spellbound, listening to him as if in a trance and wanting it to go on and on. For me, it brought back fond memories of my childhood, when my father, Aadya Pipa. After coming back from office on Thurdays, we all would sing these aartis along with him. He used to sing the aartis beautifully and as I am writing this, I can hear his voice ringing in my ears. The climax was when Bapu (Aniruddhasinh) himself sang a few aartis of Shri Sainath. He then remembered and sang the aarti of Shri Swami Samarth – “Pancha-praan hay aatura zhaalay karanyaa tava aarti, saguna rupaanay yayvoona Swami sweekaaraa aarti” (पंचप्राण हे आतूर झाले करण्या तवं आरती, सगुण रूपाने येऊन स्वामी स्विकारा आरती). This was a real windfall for all of us. I am extremely pleased to inform you that very shortly a CD will be released in which we all will get to listen to Bapu (Aniruddhasinh) chanting of the stotras which we heard during “Avadhoota Chintana Utsav”, Nandai reciting the Dattabavani Stotra and Suchit Dada reciting the Mahishaasuramardini Stotra.